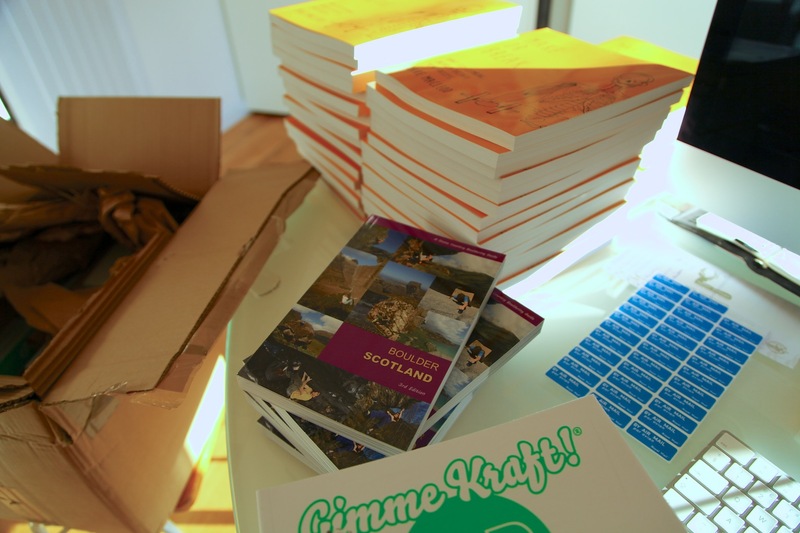 We have delivery of our stock of the new Scottish Bouldering guide by John Watson. It’s fantastic to see John put so much effort into updating this excellent and much needed guide. It’s an important contribution to Scottish climbing. Just flicking through the new expanded book, it reminds me not only of the infinite amazing boulder littered all over our country, but also of the great many memories I have of developing many of the areas myself over the past two decades. I just had, and continue to have, so much fun. From lurking at Dumby - its polish refining my technique, to hitching every day to Glen Croe for a whole summer, to more recent perfect days out in amongst the grand highland scenery of the Skeleton Boulders in Glen Nevis. If you live in the UK, and especially in Scotland, and you boulder, please don’t let your life go past without visiting many of the spots in this guide. Don’t wait for years to discover just how good the Torridonian sandstone is, or drive up the A9 without ducking in to the Ruthven Boulder. I don't really need to say this - if you just look through the guide, you'll see straight away the depth of bouldering that has been developed across every corner of Scotland in the past decade or two. Even better, let this guide encourage you to pull out a map on your rest day and go for a wander down some random glen or headland and look for new boulders. They are out there. And when you find them, it will be worth it. Just make sure you tell us about them! Here are a few videos of some recent days out, just to remind you of a wee snapshot of the boulders out there. Drag Race 8A Rannoch Moor from Dave MacLeod on Vimeo. The Anatomist, Torridon from Dave MacLeod on Vimeo. Gimme That Swing 8B, Glen Nevis from Dave MacLeod on Vimeo. Good Drying, 8A+, Arisaig Cave from Dave MacLeod on Vimeo. Dave MacLeod speaks to URBAN UPRISING from UrbanUprising on Vimeo. I’m delighted to say I am now an ambassador for the charity Urban Uprising, which takes children from deprived backgrounds climbing. Sounds simple, but it can transform people’s lives, as it did mine. It shows them that someone believes they are capable, it shows them a new world of the outdoors and adventures. Climbing and the outdoors also offers some respite from the stress these young people have to face. I think that being given a window into another world like this, a sense that good experiences are possible, is critical for these people. So I’m right behind it, and encourage you to be as well. I'm joining other great climbers on their team such as Robbie Phillips, James Pearson, Caroline Ciavaldini, Niall McNair and Natalie Berry. I hope that through any influence I have, I can help raise some awareness and ultimately, raise funds to make the Uprising projects happen. If you are able to donate something directly, do it! It’s easy (instructions here). Another cool way of helping is to buy one of their T-shirts. One T-shirt gets one child climbing for the day. That is pretty cool. Yesterday was a fun day climbing Knuckleduster Direct VIII,8 on the Ben with Helen Rennard and Dave Almond. It was also my first day leading trad since breaking my leg in the autumn. I was very slow placing the gear, and placed a lot. But otherwise fine. 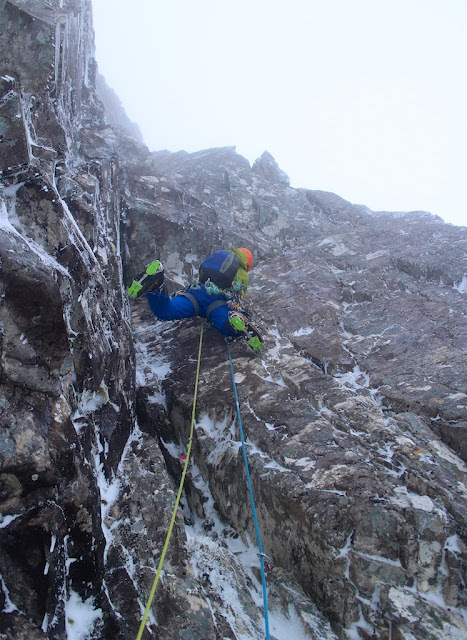 It was certainly a good idea to have a gentle break back in to trad leading again. 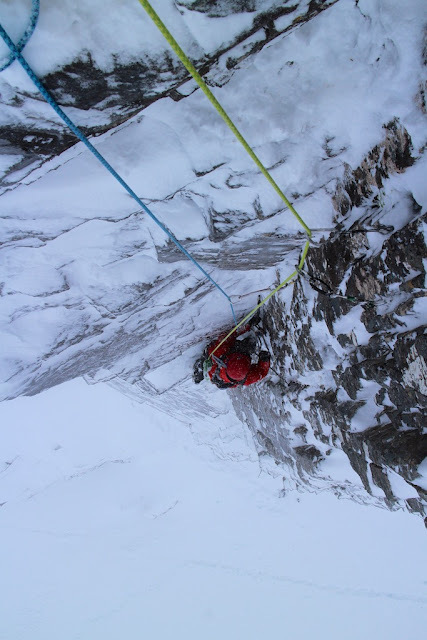 The route was first climbed by Greg Boswell and Guy Robertson in 2012. All four pitches were really good fun, with mostly positive hooks, especially where you really need it. In fact, I got my tools stuck in the crack twice on pitch one! The highlight of the day was the lovely moonlight as we abseiled back down. The Ben is a little worrying right now, with a lot of loose blocks which are not keyed-in as they normally would be since it’s been both very dry and snowless this winter so far. It still feels like November up there. FWMF Showreel 2017 from Fort William Mountain Festival on Vimeo. The Fort William Mountain Festival is always a highlight of the year for me. In fact, aside from climbing trips themselves, it’s the most important mountain-related date in my diary. It’s always an inspiring gathering of all the like-minded outdoor folk of the UK. We socialise, watch films, coach climbing and see some lectures that you just get at the many mountain festivals around the world (I’ve been to most of them, many times). Anyway, I would say that. The festival weekend itself also marks the end of the busiest work period in my year. Each year I edit the festival showreel, the mountain culture award films and also my own films for the festival. This year has been maybe my busiest. I’ve just finished seven pieces of film and I’m exhausted. As the last one uploads to dropbox, I was straight back on my board and felt much better, and tomorrow morning I’ll be heading off into the fresh snow that finally arrived on the hills today. Great! Above is the festival showreel. Putting it together always gets me psyched not only for the festival, but for the start of the climbing season proper in Scotland. Here we go! Hopefully see you folks from all over the UK and Europe at the festival in a couple of weeks. I'm running coaching masterclasses all weekend during the days at my wall (there was a cancellation on one booking yesterday - ring Claire on 07813060376 if you would like to fill it!). We also have a stall at the festival nights as always, selling books and films, so come and say hello.